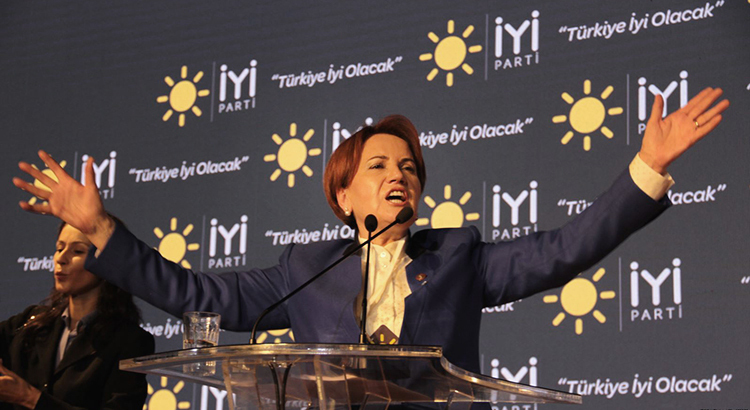 The IYI Party’s central figure is the politician Meral Akşener. Akşener used to be known as a right-wing nationalist. 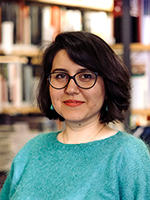 During her university years, she was involved in the student group of the ultranationalist Nationalist Movement Party (MHP) called Ülkü Ocakları. Throughout her own political career, Akşener was not too choosey. In the 1994 local elections, she was a candidate of the centre-right wing party Doğru Yol Partisi (DYP). After she resigned from DYP in July 2001, she declared to join the “reformists” alongside with Recep Tayyip Erdoğan and Abdullah Gül. Eventually, Akşener worked for the AKP. In November 2001, however, she quit her collaboration with AKP and joined the MHP due to her disappointment with Erdogan and Gül. She voiced that they maintained their religious political orientations, which had been shaped by “Milli Görüş”. Akşener also filled important political positions: she served as the Minister of the Interior between 1996 and 1997 as part of Necmettin Erbakan’s RP (Welfare Party) and Tansu Çiller’s DYP coalition government, and as Deputy Speaker of the Grand National Assembly between 2007 and 2015 under AKP rule. Lately, she has been seen as the only challenger of Erdoğan and a new political force, which might change the current situation in Turkey. Some newspapers in Europe and the United States even reported about her as the “Iron Lady of Turkey” due to her open stance against Erdoğan during last year’s controversial referendum, which proposed crucial changes in the constitution. Her political background, however, shows that she is rather another mainstream conservative and nationalist Turkish politician. The AKP and the IYI Party: Similar but different? According to the speech of Meral Akşener on the founding congress of the IYI Party, the party aims to be inclusive, as the AKP also once aimed. Indeed, the IYI Party leadership does consist of different politicians from different parties such as from the Democratic Left Party (DSP), the former centre right wing party DYP and also from the AKP. However, this seemingly pluralist mixture does not show that the party will be a progressive new force in politics; the position of the party rather is in the centre right wing and pursues nationalist politics. This is already indicated by the symbol of the party’s logo: it is derived from the Old Turkic Sun symbol and the name of the party “IYI” means “good” in Turkish; in capital letters, it is also a symbol of the old Turkish tribe Kayı, which is believed to represent the ancestors of the Ottoman dynasty. The same symbol “IYI” is used quite often by ultranationalists and also by the AKP in party meetings. Moreover, the IYI Party declares that one of her principles is to place “the nationalism in cultural and economic fields”. Unfortunately, it is not explained what kind of nationalism is alluded to. Therefore, this „new“ party might also fail to attract those minorities and the liberal segments of the Turkish society, whose criticism of conservative politics stresses the neglect of the “others” by and under the AKP government. In other words, the IYI party represents the – typical – modern face of Turkish conservatism. The main duty of the political leadership is to open up the transformation which is demanded/appropriate with the zeitgeist. The same issue was also stressed in 2002 by the AKP and the promise was made back then that the newly founded AKP was “reformist and modern”. Moreover, Akşener also emphasized the crucial importance of democracy by defining this new party is “a march of democracy” and stated that “…individual freedoms will be extended”. This was exactly what the AKP also promised in the party’s 2002 election statement, namely the interest in “pursuing and focusing on the individual freedoms”. Finally, the AKP came into the play as a political response to the failures of the previous coalition governments and their inability to come to terms with the changes in world politics. In a similar vein, the IYI Party has risen due to the AKP’s lacking capability to pursue such changes and due to recent years’ undemocratic developments that were initiated by the AKP instead of fostering the European integration and standardization process. When the AKP entered the stage of Turkish politics, it was celebrated at home and abroad as long-desired agent of change, that would pace Turkey’s path of democratization and finally make it an EU member state. The same can be observed right now regarding Akşener and IYI Party’s entrance in the Turkish political scene as the challenger of Erdoğan. May the IYI Party end the AKP Era? In a certain sense, it seems to be a correct observation that Akşener’s new party poses a threat to the AKP. Many politicians from left-wing opposition parties are currently imprisoned and numerous human rights activists and journalists are on trial. As a result, political debates have virtually been disabled in Turkey. In an environment of shrinking spaces for open political controversy, every minor struggle can be perceived as an important sign of opposition. However, if the political alternative is – once again – understood as if embodied by just one person and/or one party, Turkish democracy is unlikely to recover any time soon. The opposition is in fact much broader than the one group that is represented by the IYI Party. Yet another pitting of one party against another one is not going to be sufficient for democratic consolidation in Turkey, as the two prominent Turkish political scientists Müftüler-Baç and Keyman argued in their analysis: the past decade’s dominant party politics in Turkey, which refers to one party’s electoral hegemony with a weak opposition, has yet not enabled democratic consolidation. It was precisely a turning point in the AKP era, when the party started acting as if the only political force in the decision-making process. Furthermore, in the Turkish context and due to the Republic’s constitutional history, the dominant party can easily pave the way to authoritarianism by shaping the ideological state apparatuses. As we observed in the recent years, the AKP managed to take over central state bodies; and is now in the position to use state institutions such as the education system or religious bodies in order to stabilize its own position and gain hegemony with the help of nationalist arguments. The same line of thought, i.e. enshrining the Turkish state with one reading of nationalism exists in the IYI Party as well. This parallel to the AKP raises another question: would another nationalist party – like the IYI Party – really make a difference? In sum, Meral Akşener’s background and her newly founded party’s general orientation indicate that the IYI Party is another political actor whose main interest is to maintain the conventional political discourse in Turkey but does not offer a profound alternative. It would be a big mistake and misrepresentation to reduce the Turkish opposition to this party and leave the left-wing opposition disregarded. It is centrally important to strengthen the recognition of diversity in the political sphere in Turkey. Although it is too early to evaluate into which direction the IYI Party will develop, the first impressions give no reason to expect anything substantially different from what Turkey has experienced under the AKP and before. Rather than placing hopes in another right-wing party that could again create a dominant power center and monopolize Turkish politics, initiatives should be taken to revive a political competition that includes the full political spectrum. If the IYI Party honestly strives to change Turkish politics, a first step and sign of credibility would be to mobilize for the inclusion of more oppositional voices.